​A landscape that is functional, as well as, ascetically pleasing is our main goal. We spend the time to gather information from you to create a design that fulfills your expectations and priorities. We bring years of experience in showing how you can transform your existing landscape into beautiful outdoor living spaces that you can enjoy. A beautiful landscape that is well thought also adds significant value to your property. Whether you are looking for commercial landscaping or residential landscaping, we at Ross and Jack’s are ready and able to serve you. Contact us today to schedule an appointment for a no obligation consultation. 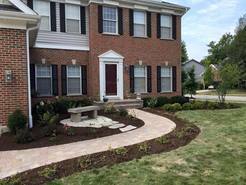 Call (847) 451-1591 or fill out our contact form to get ideas as to how we can help you improve your residential or commercial curb appeal. Pavers are the perfect solution for high traffic areas such as a walkways or driveways. Their ability to withstand tremendous pressure and heavy a load makes them a number one choice for homeowners looking for lasting results. The variety of pavers is quite extensive, and the patterns can be quite simple or extremely elaborate. Using Pavers will also increase the value of your home or property. The Dry Creek Watershed Flood Control Plan provides a detailed hydro logical analysis of the watershed, provides recommendations for feasible regional flood control projects, means to mitigate development projects, and recommends an updated landscape plan. We build and install arbors and pergolas into your outdoor landscape designs. Whether you’re dreaming of an entry way into your outdoor spaces or some cover in the form of a pergola we can do it. Add Low Voltage Landscape Lighting Accent your pergola and landscape. The quality of a new lawn is directly related to the success of establishment. Turf establishment begins with careful planning, knowledge of soil conditions, and an understanding of the environmental and cultural requirements of turf grasses. Though we offer these clean up services to all of our maintenance customers as part of their contract package. We understand that there are many clients who like to maintain their own property, however, find it a challenge to handle the work load that is often associated with a major clean up. Ross and Jack's can do it for you!